Strong 7.0 magnitude earthquake hits Japan at 10:57 a.m. 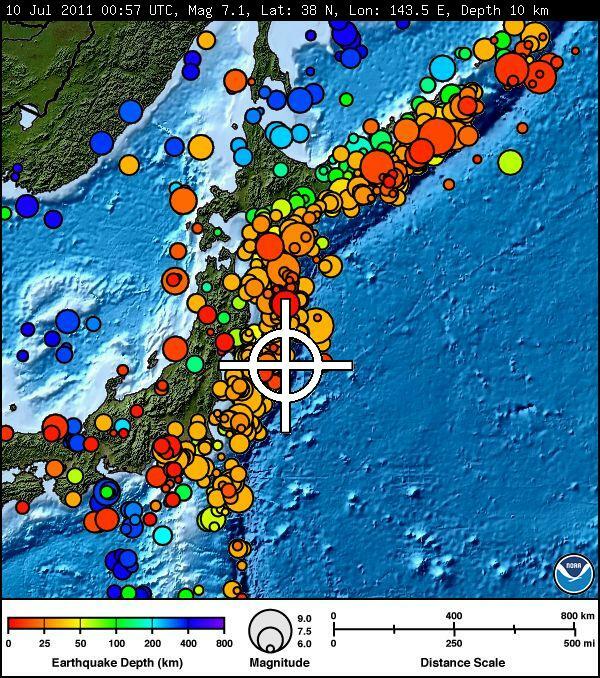 The epicenter was 212 km (131 miles) E of Sendai, 239 km (148 miles) ENE of Iwaki, 250 km (155 miles) E of Fukushima, Honshu at depth of 18 km (11.2 miles) according to USGS. EMSC's seismographs recorded 7.2 magnitude. Tsunami advisories were issued - and then canceled - for the coastal regions of Iwate, Miyagi and Fukushima. The areas were among the hardest hit by this year's devastating earthquake and tsunami. Officials in Ofunato, a city in Iwate, advised residents to evacuate. Small tsunamis were observed along the coast, measuring between 10 and 20 centimeters, said the Japan Meteorological Agency. There were no immediate reports of injuries or damage at the epicenter, about 130 miles east of Sendai. 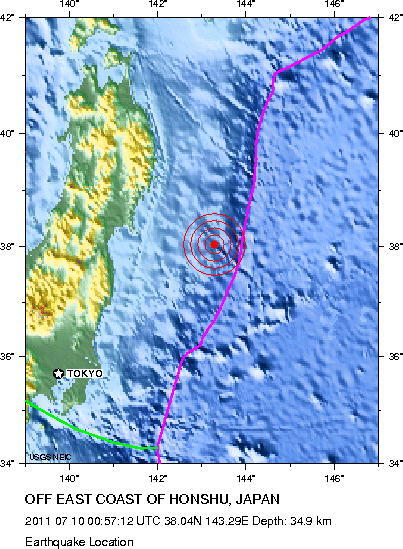 The JMA, immediately after the quake, forecast the height of the tsunami could reach half a meter (about 20 inches). No immediate abnormalities were reported at nearby nuclear facilities. Tremors from Sunday's quake were felt as far away as Tokyo.